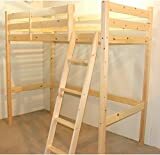 Loft beds are also known as high sleeper bunk beds and have a very distinct design. 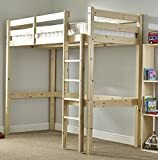 The bed frame consists of a similar design to that of a single bunk bed, but there is no bed at the bottom, only a single bed at the top. Hence it is designed to sleep one person. 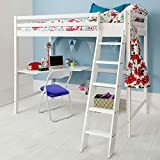 Loft beds are available as single or double (sleeps 2 on the top) beds, although more commonly they are available with a 3ft single bed at the top. The main advantage of a loft bed is the extra space you'll gain from underneath the high sleeper bed. 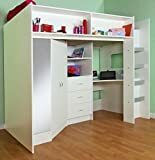 You can use this extra space for storage, a play area or even workspace for your child. 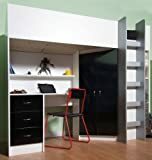 Some loft bed designs incorporate a cupboard and desk as part of the bed, which makes things more convenient when shopping for separate beds, cupboards and desks. 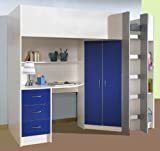 Buying a single unit which incorporates the 3 items with matching designs will look like a complete unit and will be designed to take up far less space than buying the 3 items separately.